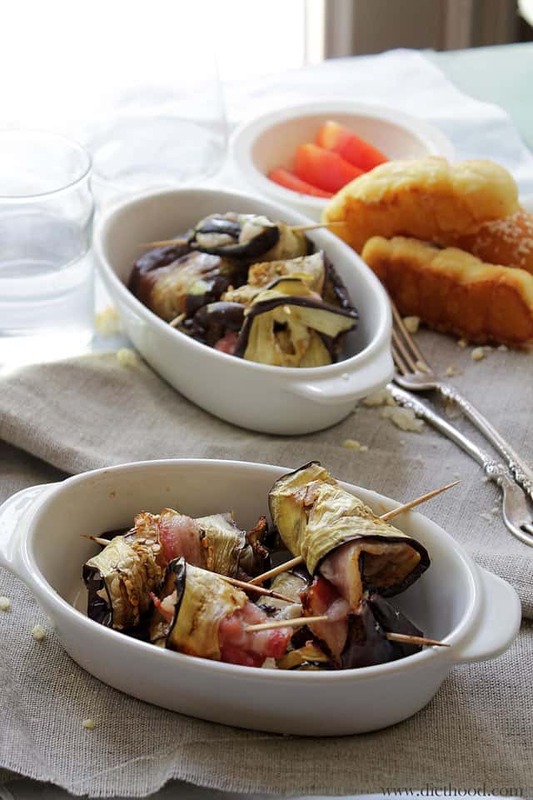 Grilled Eggplant Rollups – Grilled eggplant rollups stuffed with bacon and goat cheese. Yeeeeeeeeeees! I’ve been waiting forever to tell you about this deliciousness. I finally get to share one of my bestest grilled veggy appetizers with you! Grilled Eggplant Rollups with Bacon and Goat Cheese! Booyah!! Then again, how can it not be the best when there’s bacon in it! And goat cheese! I know, I’m totally freaking out about this one, but for real, this stuff is amazing. I first made it some 3 or 4 years ago and since then, as soon as the weather reaches 70 degrees, I’m out there rollin’ up the eggplants and grillin’! You should never underestimate the power of a veggie… With bacon. You wanna know what else is exciting?! My baby girl started to walk today, hands free! For the past 3 months she’s been holding onto furniture, walls, appliances… but today she finally let go! She’s so excited, and quite frankly, so am I! Wait! I’m not done sharing! By the ways, her 1st Birthday is coming up on June 4th! Grilled eggplant rollups stuffed with bacon and goat cheese. Layer the eggplant slices on prepared sheet and brush with olive oil and season with salt and pepper; set aside for 30 minutes. Place eggplant slices on grill and cook until slightly tender, about 2 to 3 minutes on each side. Cook bacon in microwave for about 1 to 1-1/2 minutes, or cook in a frying pan until partially cooked but not crisp. In a small bowl, combine goat cheese and minced garlic. 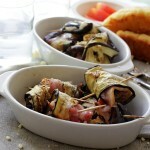 Remove eggplant from grill, top each with a slice of bacon and a teaspoon or two of cheese mixture. Roll up the eggplant and secure with toothpick. Return to grill, place seam side down, and cook for another 5 to 7 minutes, or until thoroughly warm and cooked. Need more Eggplant Recipes? Check these out! Yummo! Could do with these right now. We just had an eggplant rolitini appetizer at an Italian restaurant this weekend and I’m still dreaming about it! This sounds SO good! This is SO my kind of meal! And congrats on your little ladies first steps!!! Eggplant and goat cheese together on these delicious little bites! yes:)How exciting about your daughter walking-yay!! You had me with bacon and feta! I don’t care what it’s wrapped in, it’s got to be good. Actually I love eggplant and this looks like a great appetizer! Congratulation on your daughter’s first steps! What an amazing life moment for her and you. I *love* grilled eggplant, these look amazing! Bacon and goat cheese – yes, pretty please!! This looks wonderful–I love eggplant, bacon and goat cheese and my kids love bacon and goat cheese. I believe this will make a great eggplant delivery device for them. Congrats on your baby girl’s milestones! 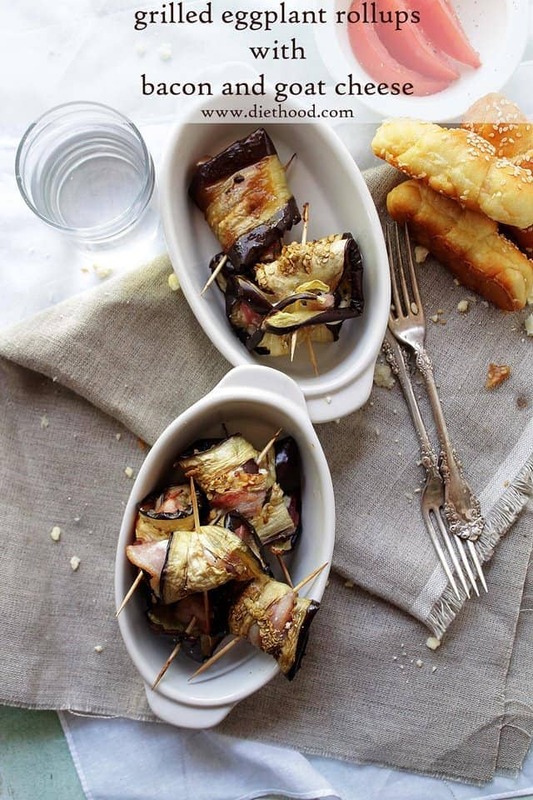 These grilled eggplants appetizer are a must-have definitely! 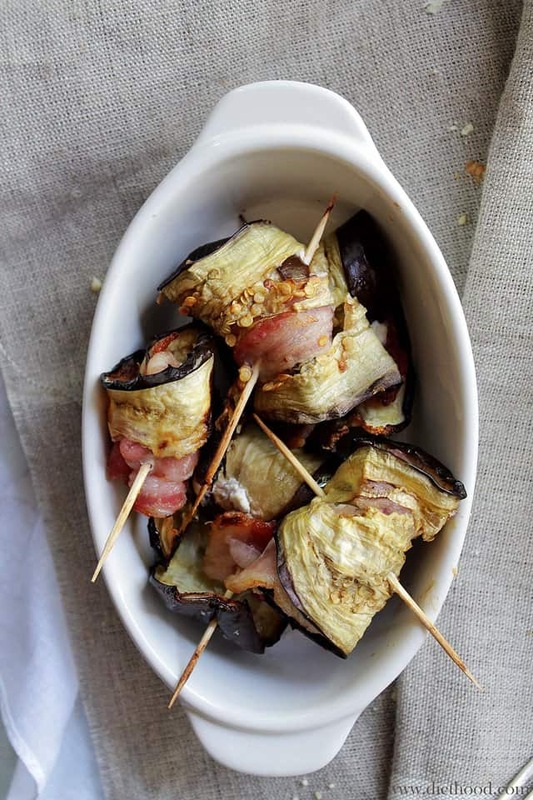 I love eggplants and if they come with bacon and goat cheese even better… Great, easy recipe and beautiful photos. I think eggplant can go either way based on taste. Personally I love it, if made properly! These look absolutely amazing! Give me eggplants and goat cheese and I´m a happy person. Really, this might me the best meal for me. And with bacon too!